The darkside. Your chance to vote. This is a first. I generally don’t post pictures of Vespas. I’ve got nothing against them, other than a general low-level bitterness that out of the two GREAT Italian scooter marques, Piaggio’s Vespa survived and the clearly superior Lambretta didn’t. And I’m not a “scootist”. Some of my best friends ride Vespas. In fact, Vespas are (probably) my second favourite scooter marque. But they are all over the web, and there’s some great sites covering both (try Scooternova) or that cater to the poor deluded souls who actually prefer Italy’s second best scooter (my personal favourite, being this one; Vespamore). And, much as I may have huge gaps in my Lambretta knowledge (I literally learn something new nearly every day), I am a complete ignoramus when it comes to the Vespa. I’ve never owned one*, and I’ve never even ridden one. So I can’t really write abut them. Anyway, this long, unfocused and rambling diatribe is needs to get back on track. Here we go. I generally don’t post pictures of Vespas. But occasionally, I come across a picture so good it’s hard to resist the urge to post it. Above is one such shot. So… here’s the deal. Should I post the occasional pics of a Vespa, or are they truly off limits on a Lambretta site. This is your chance to vote, below. 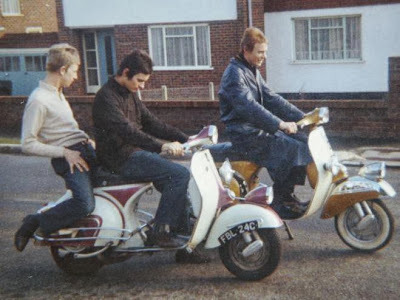 *I nearly bought a GS160 before I saw my current Lambretta – this would have been a very different blog! This entry was posted in Humour, News, Not a Lambretta, Scooters and tagged Italy, Lambretta, opinion, Piaggio, poll, scooter, Vespa, Vespamore, vote by crocodilejock. Bookmark the permalink. Naaah! Keep it Lammy please. Enough sites doing others as it is!